Once again the crunch of leaves on the ground and the cool breezes signal the arrival of autumn. But soon the beauty of the changing colors and smells of fall let way to the need of raking! If there are kids around, you will be faced with an increased amount of time spent gathering all the leaves into a wonderful pile for them to jump in. But with all of this raking comes the potential for injuries. 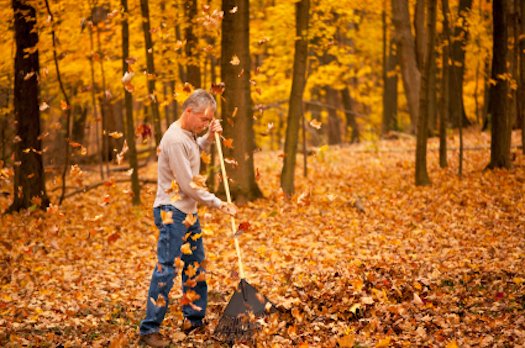 So we ask you be mindful of how you rake and keep these simple tips to keep Fall fun. Use a rake that is the correct size for you and for your task. Wear gloves to avoid blisters. Do not twist, instead move at your hips and legs. Keep elbows close to your sides to prevent shoulder injuries. Do not throw leaves with the rake, instead pull them towards you. Cool down stretch and ice if necessary when finished. As with shoveling you should pace yourself, drink water and take breaks when needed. If you experience shortness of breath or chest pain call 911. And for the kids, make sure you know what is in that pile of leaves before they jump in. Many times the leaves may be raked up to a rock or other object, and a forgotten rake left in the pile could end in a painful or dangerous jump.